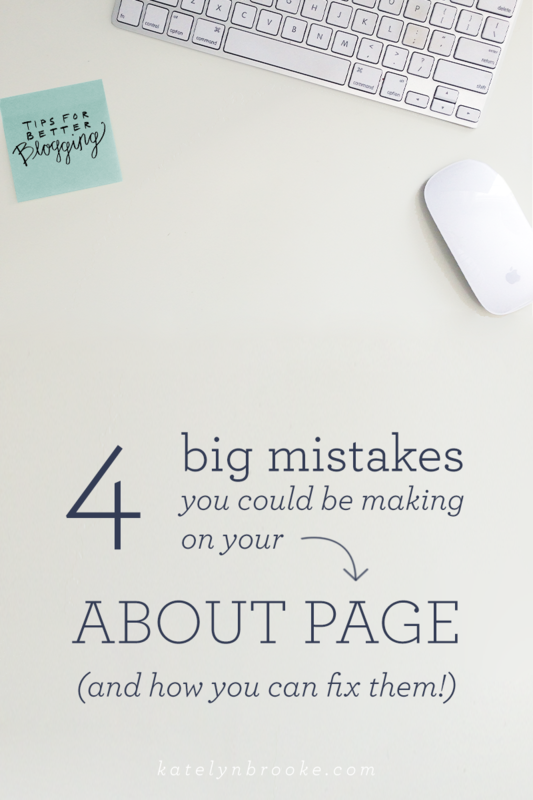 Let’s face it: writing your about page is hard. I mean, who really enjoys writing about themselves? It can be kind of uncomfortable. Ever since I’ve had a blog, I’ve hated writing my about page. When I had multiple blogs and a business website, usually the blog pages came more easily to me- I felt free to be more casual and just talk about me and my life. Ouch, right? When I combined my sites and did some redesigning earlier this year, I gave my about page a much needed makeover. Now that it’s been a few several months, I went back and isolated 4 things that were really wrong with it before, that I tried* to address in the newer version. *I want to preface this by saying that I wrote this post and then looked at my about page… and wanted to do the whole thing over again. The old about page wins again! So try not to hold me to these standards, because there’s always room for improvement. Everyone has a story. Where you’re from, when you born, what you studied in school, etc., etc… and for most of us, our story is pretty ordinary. Mine certainly is. The trick is finding a way to tell your story that doesn’t bore your audience to tears. Think about this part as a writing sample. Your voice needs to pour out of your story. It should be written in the same style as your blog, or your social media, or whatever it is that you’re putting out there. A word of caution: if you are a solopreneur, please don’t write in the third person. I think people do it because they think it sounds more legit, but it actually just sounds more impersonal. A few weeks ago I had a lightbulb moment when I was discussing about pages with a client. Your about page is where you need to share all the things that set you apart from the other people in your industry. Your occupation, what you are, be it web designer, photographer, or blogger, that is the fixed point. People probably know that part before they even click on your about page. So you need to pivot. You don’t need to talk about that fixed point, you need to talk about all those things the reader doesn’t already know about you. I’m not one of those bloggers who thinks that all blog posts need headlines, bolded words, and three different colors of text to make them more “scannable.” Sometimes you just gotta write. But on an about page? For your business? People need something to grab them. I didn’t play to my strengths. I’m a web designer. What was I doing with a page full of text? If you’re a writer, write. If you’re a visual person, make it visual. The good news with about pages is that it can be whatever you want it to be, and more creative is generally better! Be different. Want more tips on your about page? When I was working on my page, I thought these posts from In Spaces Between, Copyblogger, Amanda Genther, Blogging with Amy, Allyssa Barnes, were really helpful! What is your biggest struggle with your about page? The other tips and ‘about page’ examples you shared are GREAT too. Mine definitely needs a refresh after reading this. I feel like that’s a mistake too. As the blog changes so should your about page. At this point mine is almost a year old. These are great tips. I think I’m going to redo ours. It for sure needs some tweaking. I redid mine a few weeks ago but need to work on it again. Thanks for this, I pinned for later! Kate, you’re right on with your tips. So many people think about their about page as if it’s a resume. It’s a story, not a cover letter. I especially love the timeline you designed for yours. This is such a great great post I really appriate that. I had exactly the same struggle when I just started my blog one month ago before fashion week. Everything was set up, going well, but writing my about page? ! That was such such a pain!! Even now I still think I need to fix it so much and you just reminded me! Oh! I need to work on this!!! Thank you so much again! Love u! Thanks for this great advice. I’ve been doing a lot of research and I’ll definitely keeps these ideas in mind for when I re-do my About Page. Love the timeline too! Very well said. I am new to the blogging world and I think that my ‘About’ page is definitely lacking. As you said, it needs to be where you set yourself apart from the others and have people warm to you! All suggestions have been welcome! Thank you! my about page is B-O-R-I-N-G but this article totally sparked an idea for a new about page! thank you so much!! I love the picture time line on your about page. I think your tips to match your about page to your personality are perfect. This is beyond true and like a true student- I took notes to take back to my about page. I struggled to easily write about myself and make it interesting- but I know I am more fun than my about page suggests! Thanks for the tips! Great advice. I changed my about page from sounding distant and business-like to more casual, like someone my readers might want to get to know. As an author who (hopefully) writes believable characters, I want to be approachable and easy to relate to as well. Thanks for sharing. Love you article! I love this post because I never thought about talking about my other interests! I think my about me page is kinda cliche…it’s totally me because I love quotes and am very visual but I just feel like it’s not original enough. Maybe I will add more of what people don’t know! I’m still building my site, I’m really grateful for those tips. Greetings From Panama. SO TRUE to literally everything here! I use my website as a blogging platform, but I also supplement my resume with it, and I had such a hard time figuring out how to tailor my “About” to fit with both of those. Finally, I just threw my hands up and wrote what I would want to read about somebody else- if someone wants to hire me based off my writing skills, that’s where I get to showcase it. Sometimes it’s so good to just do YOUR thing! Great tips! I’m summoning up the courage to rewrite mine, it really is such a tough page to get right! This tips are fantastic! I used them to help write my About page on my newly launched blog! Blogging is definitely a new world for me, so I’m excited to read through yours for more advice and best practices! A year ago, I bought a domain…. …and did nothing with it because I didn’t know what to write in my About Page. Thanks for the tips! I constantly struggle with what to put on my “About Me” page, finding that balance between relating to my reader without going overboard is tough! Right now I’ve got an “About” page that gives them a snippet of me, but it’s more the story of the blog coming to life, and then I’ve got a page from there that they can go to to find out more about me and my family. We’ll see how that works, I’m sure I’ll want to change it up again soon enough! Thank you so much for the article and interesting “About me” examples! That page was truly painful to write and I feel like mine is extremely boring and definitely not catching. Hope I will be able to rewrite mine soon. Thanks for tips! Your “About Page” is awesome. It was the first thing I checked after seeing this post. I like the 2 column layout and the one-page, no sidebar approach which make it clean and professional. I will most definitely be redesigning mine. Thankfully, I found your post before writing my “about me” page! I’m hoping people will like it (and me)! Thank you for this information!